Suvorov’s orders for the next day, were the following: “Shvejkowsky’s Division, which has taken the right wing position after Casaliggio, must pass through the Trebbia, sending forward Bagration’s vanguard, advancing through Gossolengo, Caselle and San Rocco, towards the Nure creek. Förster’s Division, deployed from Casaliggio till the Trebbia, must pass the river towards Valera and Pittolo and advance until the Nure, through Castellaro and i Vaccari. The third kolonne Ott had to send the Fröhlich’s Division or the cavalry brigade Liechtenstein on his right, linked with Förster, and must advance towards Piacenza, occupying the city, if left by the enemies, then marching towards the Nure through Mucinasso. The attack will begin at 8 o’clock (note: on the Austrian papers the hour was the 6 a.m.)”. Macdonald, suffering because of a violent fever, contined to accuse Moreau of having abandoned him at his destiny, leaving him alone against the whole Coalition Army. The Republicans had about 26000 men, which could be considered fit for combat, and only 28 guns. Against them were about 42000 Austro-Russians, supported by 62 artillery pieces. However the Armée de Naples Chief wanted to attack, even ending with a glorious death in battle. So Macdonald, who had taken the command provisionally given to Victor, who was also sick, split the forces in three sectors. Macdonald was almost sure of a victory, now having two more fresh divisions at his orders, and did not organized any reserve behind his lines. He consider Watrin’s Division as a strategic reserve, which could be committed where needed, from its central position. The Austro-Russian attack was planned for 8 a.m., but the troops’ fatigue suggested a two hours delay. However, the French right was the first to open fire. At 5 a.m., at dawn, one infantry battalion and some cavalry approached the Austrian lines and opened fire. General Mélas sent there an artillery battery, which opened a deadly canister fire, causing the French to run back until the Trebbia. They stood there, for some hours, watching their opponent move. Commander: Obst Franz Weber von Treuenfels at Verona with his Grenadiers. At the fatal hour, 10 a.m., the French moved first. They began to get the “ordre de bataille” along the river bank, while Dąbrowski forded the Trebbia at Rivalta, marching upwards on the slopes, in order to surround the Coalition’s right wing. Many French columns began to pass over the Trebbia, advancing slowly, with cordons of cavalry interposed between the columns. A whole battalion elongated itself in a “tirailleurs” line, on the right bank of the river, in order to support, with musketry and artillery fire, the friendly advance. Each column had a dense chain of skirmisher at their head. At 10.30 a.m. the Poles came under the fire of the Russian batteries, but the Legion continued to advance. They captured and cleared Rivalta at 11 a.m., while the Russian expellled from the village took cover among the houses of Gazzola, leaving a gap in the line, 1500 meters wide between the left of Bagration and the right of Shvejkowsky, into which ran the Rusca’s Division. Rusca, had already detached the 55th Demi-brigade with the I Battalion of the 97th line infantry to support the Poles, giving the command of the detachment to Chef Dargoubet (Dagobert?). He had passed the Trebbia at 10 a.m., but was stopped by the fire of Shvejkowsky’s batteries, 14 pieces (mainly 4 pdr. and 8 pdr. guns) which bombarded the thick columns of the French, with the explosions spreading the gravel of the river bed as additional deadly weapons. Soon Rusca’s units were forced to stop their march. They were able to move only after midday, entering the above mentioned gap in the Coalition’s lines. In the meanwhile, the III Battalion of the 55th Line Infantry, led by its Chef Ledru, had left behind the undisturbed Poles, and had reached the village of Tuna. From there, it fell on the flank of the Rozenberg Grenadiers, who were forced to retreat. Prince Constantin, aware of the danger, reformed the line with two battalions of the reserve and closed the breach. Victor had made his river passage at 10.20 a.m. but his advance was quickly stopped by the opponent’s skirmishers. Taking frontally Casaliggio with a large column, flanked by the cavalry, in order to link the units with Rusca’s, he had a timid approach to the battle, probably fatigued after three days of continuous fighting. Outflanked by Cossacks and Russian jägers, they withdrew in a real hurry passing back over the Trebbia. There Victor marched southwards in two columns, under a burning sun, in order to find a more suitable passage point. That “promenade”, under the Russian bombardment, almost caused a complete rout of the fatigued soldiers. So Victor decided to withdraw to more covered positions, practically exiting the battle. At the other side Rozenberg, also on the receiving end of French artillery fire, stopped on the left bank (at 7.00 p.m. the fire ceased in the Victor’s sector). The French right, under Olivier, had to advance from 10 a.m. However in these new ivisions there was a definite mood of dissatisfaction, not so far from a mutiny spirit. It was very difficult to control the 5th Légère, in which the Chef Antoine Chatagnier was doing every effort to reorganize his troops. So Olivier had to wait for Montrichard to move, before beginning his advance. At midday, the French right passed the Trebbia, with Montrichard upset by Olivier’s behaviour and with the Austrian generals Ott and Fröhlich very concerned about how the attack would affect their lunch. Inspite of a strong artillery bombardment, the French right wing advanced, routing the Austrian troops surprised around the field-kitchens. The road to Castel San Giovanni was taken by Montrichard’s column and only the intervention of platoon of the just reorganized Wouwermann Grenadier Battalion, deployed into some ditches, stopped the French advance. On their right Olivier continued to advance, followed by Watrin, in a more extended position who marched until the Po, and was flanked by General Salme’s troops. At 11.30 a.m. the extreme right of the French army accelerated. Maucune, adjudant to Watrin, went forward attacking the Po bank. Jacquelin with the grenadiers of the 62nd Line passed a marsh and engaged the Banater Battalion, forcing them to withdraw and losing their 10 guns. Behind them was General Salme, riding with an elite patrol of the 19th Chasseurs. Watrin organized all these scattered troops in three columns, with the order to follow the Po and to encircle the enemies. Montrichard turned them towards Campremoldo, with the will to support Victor or Olivier, whenever necessary. His troops were heavily harrased by the enemy musketry and artillery. “The day after, around the 11.30 a.m., while he was at lunch with some Officer and my Aid-de-Champ, we heard the cannons shooting. I took an horse but, after only twenty footsteps, I was in the middle of a chaotic bunch of coaches, men and horses, which were retreating from the line. The chaos was indescribable. I took the Lobkowitz Dragoons and lauched them in the middle of the vineyards and, after having jumped over around 50 ditches, I had the luck to catch the enemies and to attack them by their rear … The enemy positions were covered by trees and bushes; between us extended a sandy terrain, broken by small water channels. There was no time to wait, the enemy in eight minutes could have reached Ott’s camp, and I ordered to charge. The enemies partly fleed away but their guns continued to fire against us, with canisters, while some French cavalry covered their retreat .. I fought there for all the necessary time our infantry needed to reorganize the ranks and to deploy the lines.” (Arch. of H.H. Prince Johann Liechtenstein. Family papers) . Olivier did not loose his control and manoeuvered a brigade to face the Russian troops of Förster, advancing by the road side, but was stormed by a rain of cannonballs, which disordered his ranks. He himself had a leg cut off by a cannonball, fainted near Macdonald and was taken away by the “Santé”. Chef Darnaud, of the 30th line, formed a square, stopping for twenty minutes the Russian infantry and allowing the other troops to retreat. Then Darnaud spread his soldiers among the trees and the vineyard engaging a sort of “guerrilla” warfare, while slowly retreating towards the Trebbia, which was reached in the evening. On the French right wing, only Watrin stood on his positions, in front of Calendasco, while Montrichard was routing and Olivier retreating. The dangerous advanced positions taken by Rusca were counterattacked in the late afternoon by General Chasteler. He gathered at Casaliggio 2 fresh battalions from Shvejkowsky’s and 3 from the Förster’s Division. With these troop and with the flanking Levenehr Dragoons he assaulted Rusca. 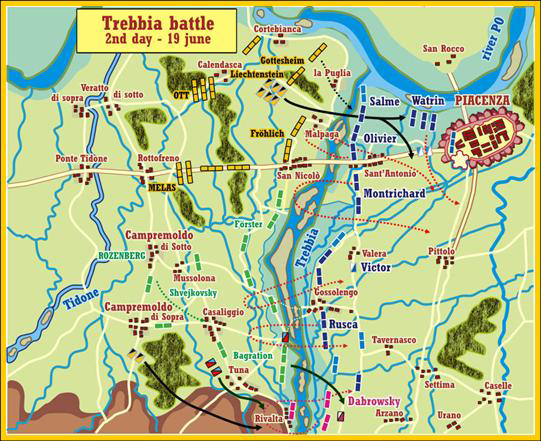 The French general did defend at his best for about 20 minutes, but he was forced to go back, towards the Trebbia. It was a slow retreat and only in the evening, Rusca passed the river, leaving the left bank. Suvorov came by Ott headquarters, escorted by the Cossacks. He ordered Ott’s Division to advance, headed by two fresh grenadier battalions, flanked by his 200 Cossacks, the Archduke Joseph Hussars and 10 dragoon squadrons (Lobkowitz and Levenehr). The earth trembled under the galloping horses. The avalanche of men, horses and cannonballs overran Watrin, forcing him to reach Cascine on the Po bank. On the left bank of the great river, Colonel Kinsky, come from Mantua, installed an heavy battery and bombarded the Republicans on the opposite bank. At dusk, Watrin passed back over the Trebbia, which waters were described as red for the blood, leaving 351 prisoners in enemy hands. At 9 p.m., the battle definitevely ended with a complete French defeat. Victor had the main responsibility of the events together with Dąbrowsky and 5th Légère routs, but the Austro-Russian superiority was the real cause which led to the defeat. That same evening, Macdonald, not hoping anymore for help from Moreau, frontally threatened by Suvorov and on the flanks by Klenau and Hohenzollern, who, passed again the Po, were heading to Modena, Reggio and Parma, wrote a letter to Pérignon, (which however never reached its recipient). He wrote: “… All the division generals of the army of Naples are wounded, other than two; also wounded are forty and more Officers, adjudants and other generals or Chefs. Several demi-brigades have lost from 30 to 40 Officers. More than 12000 men are out of combat; the soldiers do not have more cartridges; the artillery without ammunition. Not having news neither of general in Chief Moreau, neither of general Lapoype, I must withdraw …”(from Chasteler Papers). Macdonald’s withdrawal began the same night. He left the campfires alight in the bivouacs to trick the enemy and marched away with the favour of the darkness, directed towards the Apennins passes. Gachot counted 1600 dead laying on the terrain. The Generals Olivier, Rusca, Salme, Cambray (died after the wounds), the adjudants Grandjean, Sarrazin, Liébault, Blondeau with other 502 Officers and 7183 soldiers wounded, were abandoned at Rocco, Sant’Antonio, Gossolengo, Piacenza and into the two camp hospitals of Combarino, recommended to the Austro-Russians and Parma’s Duke mercy. The Austro-Russian lost 5273 men, out of combat: the Austrians having 10 Officers and 244 soldiers dead, 1816 wounded and 497 missing; they lost also 660 horses. The Russians lost 4 Officers and 675 soldiers dead, one General, 1 Colonel, 2 Majors, 35 Officers and 2041 soldiers wounded for a total of 2759 men out of combat. Other sources told the Coalition, over the three days of combats, had lost about 6,000 men from all causes. The Austrian lists included the losses sustained during the 20th, amounted to 254 dead, 1,903 wounded and 500 missing, a total of 2,657. The Russian losses were estimated in 681 dead, 2073 wounded, while the missing were unrecorded. Duffy says also that, upon the French losses “The only verifiable figures related to the French losses are those of the 7,183 untransportable wounded found by the allies in Piacenza, and the further 200 in Parma, from which it is fair to assume that with the dead, the transportable wounded and the missing the total could well have reached 12,000”. The regiment, during the Three Days battle, was led by Prince Liechtenstein and its divisions were under Prince Thurn un Taxis (1), Oberstlieut. Graf Alois Harrach (2), Major Ignaz Molitor (3) and Second Oberst Bernhard Grosser (4). It had some losses: 18 dragoons and 55 horses dead (among these Lieutenants Graf Mensdorff and Königstetten, aide of Prince Liechtenstein; lieut. Unruh died several days after, for the wounds suffered); 86 Dragoons and 114 horses wounded (among these the commander Oberst Prince Thurn und Taxis, Rittmeister Molitor and Rittmeister Prince Ysenburg); 3 men and 3 horses were missing. On the second battleday, a division was attached to the Bagration’s vanguard to restore the cavalry force, weakened during the previous battleday. “In a mixed column, the infantry, accompanied by its artillery, march at the head; and the cavalry always at the rear. A different arrangement would compromise the whole column in the case of a strong attack on the front, as was proved in the case of the central column of the French forces at the battle of the Trebbia (June 19, 1799).” De la Barre Duparcq, Elements of Military Art and History: Comprising the History and Tactics of the Separate Arms, transl. by George Cullum, Van Nostrand D. 1863, New York. “The terrain was so thick of vines, that it was difficult to see anything. We opened our way with the bayonets losing 6 Officers (dead), 22 Officers wounded and 300 men, dead or wounded.” War Archive “Darnaud’s report”. From Chodzko, op. cit. : “The 1st messidor (June 19), all the Gallo-Polish army attacked again the Austro-Russians. The Polish division crossed Trebbia close to Rivalta. It slipped by its line, so that the 2nd battalion was at the head: the mixed battalion made up of grenadiers, chasseurs, and of the 3rd battalion remainder followed; the 2nd and the brigade Calvin formed the rear. The ground, on the other side of the river, not being favourable for the moves of artillery and cavalry, they remained in reserve, to protect an eventual retreat, where necessary. Brun, with his half-brigade and the 1st battalion, covered this movement towards the left. The enemy wanted to dispute the passage of Trebbia, but was driven out at Rivalta. Division made a half-turn on the right, the pivot being this village, and went forward. However, being the interval too large, Dąbrowski took a French demi-brigade, which had not yet completed its movement, and placed it there to cover the troops. By this movement, the deployment became perpendicular to Trebbia and the army. To these numbers must be added the French losses of the third day (combat of San Giorgio – 1029 prisoners) and those of the rearguard fights on June 21 (Ott against the French rearguard – 120 prisoners), with the Veletsky attack against Lapoype near Bobbio (103 prisoners) and finally the Hohenzollern results of the Parma’s occupation (other 200 prisoners). The totale losses (dead) of these action were utter 500 men. For the Russians the French wounded found at Piacenza and Parma were 7383, the total of Frenchmen out of combat was not less than 2500-3000 (counting the dead ones) and, considering also 4500 prisoners of war, we can realize the Macdonalds’ army reduced by about 15000-16000 men, which left a number of about 10000 men surviving fit to combat.